Your child experiencing discomfort can be a very frustrating time for parents, especially when you're unsure of the cause. A variety of factors can cause red and puffy eyes and knowing these possibilities can help you narrow down solutions. If you're still unsure what is causing your child's symptoms, contact your doctor as soon as possible. 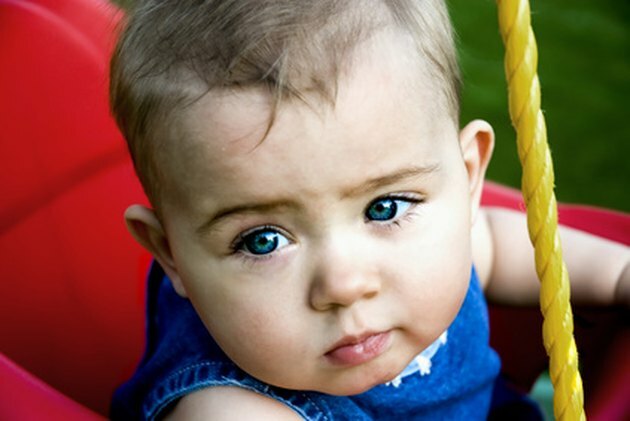 Allergies are a common cause of red puffy eyes in toddlers. According to Eye Doctor Guide, some common allergens are dust, mold, pets and pollen. Skin irritants can cause red puffy eyes, such as a father's after-shave, soap, lotions, household cleaners and perfumes. In addition, your child may have touched an irritant and then touched his own eye, which could cause the redness. Other causes could be a foreign object in the eye or an injury. Treatments will depend on the cause of the redness and puffiness. According to The Children's Hospital, a mild eye irritant can be treated by washing the face with a mild soap and water. For allergies, a children's antihistamine can sometimes be used, but your child's doctor should always be asked before using any medication. Your doctor will be able to give you the correct dosage information for your child's age and weight. According to "What to Expect: The Toddler Years," if your toddler gets a corrosive chemical in her eyes, fill a cup with lukewarm water and have someone hold your toddler still while you pour water into the eye for 15 minutes. Call the Poison Control Center or your family doctor. If a foreign object gets into the eye, pour water into it. If the object does not come out, take your toddler to the emergency room or call your doctor. If symptoms are caused by an injury, it can normally be treated with an ice pack. Never apply pressure to an injured eye. According to "What to Expect: The Toddler Years," you should also never touch the eye with your fingers, which could make symptoms worst. If you're unsure what's causing your child's symptoms, consider any new products you have been using. For example, if you bought a new type of hairspray, switch back to your old brand to see if the redness goes away. Avoid being outdoors when pollen is at its highest since this is a common allergen. According to Eye Doctor Guide, vacuum your home with a HEPA filtration system since this will trap many allergens. By keeping your house clean, you are able to reduce many allergy triggers within your home. Eye Doctor Guide also suggests using a dehumidifier in your home to control mold growth. According to The Children's Hospital, if the eye remains red and puffy for more than a week or becomes worse, contact your child's doctor. Other times to call the doctor are when the eyelid is very red or swollen, the child is blinking constantly, the eyes are watery or there's a fever over 100.4 degrees F.